The Brenham School Board approved hiring of two new Assistant Principals for the 2019-2020 school year during their meeting Monday Evening. Suzette Evans will be a new Assistant Principal at Brenham Junior High School. She has been with Brenham ISD for 15 years and currently is a 7th and 8th grade math teacher at Brenham Junior High. Evans will be replacing Robert Reyes who will be leaving Brenham Junior High School at the end of the school year to pursue other opportunities. Erin Thibodeaux will be a new Assistant Principal at Brenham High School. She has also been with Brenham ISD for 15 years and currently is an Instructional Specialist at Brenham High School. Thibodeaux will replace Matthew Wamble who left in December to accept a job as Principal of Burton High School. The board approved bids for the renovations at the High School of just over 2.5 million dollars. Scotty Lewis with Project Control explained to the trustees that the replacement of the outside air handlers at the High School will involve a little more work that initially expected. The new units are considerable heaver that those they are replacing and will need to be placed above structural parts of the High School roof. The new units will also not arrive until the first of August, but Lewis assured the trustees that the work would be completed by the start of the school year. He said by comparison, replacing the two exterior stairwells at the school will be relatively straight forward. Superintendent Dr. Walter Jackson presented the board with another update on the Texas Legislature. He said with only 11/2 months left in the session, he is closely watching the school finance legislation. Jackson said the current bill would provide an $1850 increase in teacher and librarian salaries and provide districts with an increase in state funding. Board Vice-President Melvin Ehlert commented that the district employs many other professionals besides teachers and librarians and that they deserve attention from the legislature also. 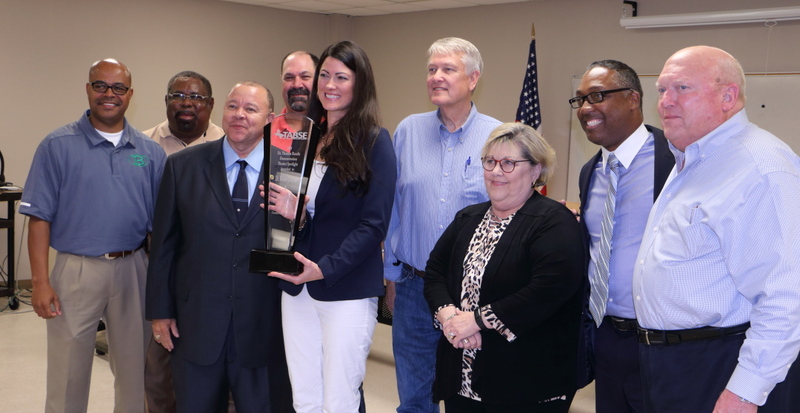 The board made two “You Make a Difference” award presentations this month. 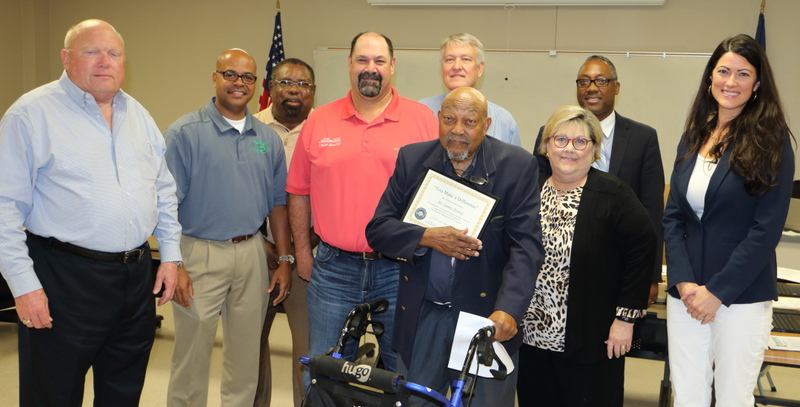 Mr. James Dennis was presented the award for his role as a substitute teacher, mentor, and historian at Brenham High School. Dennis marched for Civil Rights in the 1960’s and served as a College Professor in California for many years. 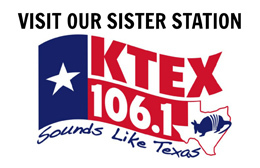 The second “You Make a Difference” award was presented to The Bush School of Government and Public Service at Texas A&M University. The school hosted 40 Junior High and High School students from Brenham who are part of the superintendent’s student advisory council. Mr. James Dennis (center) accepts the "You Make a Difference Award" from the School Board. 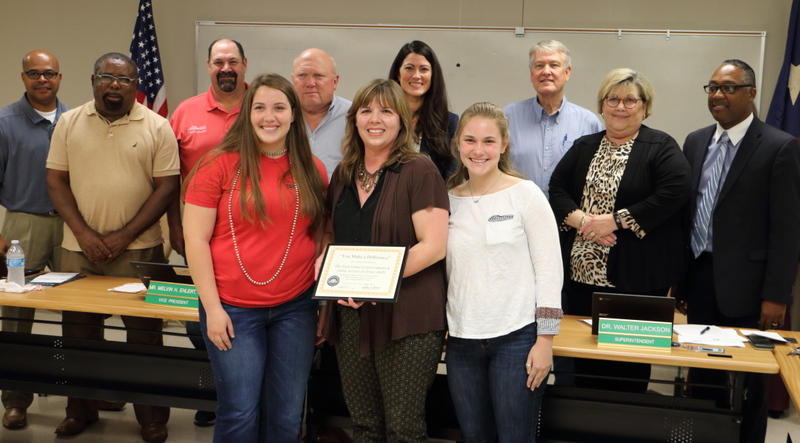 Kathryn Meyer (center) Director of Admissions/Recruitment for the Bush School of Government and Public Service at Texas A&M University accepts the "You Make a Difference" award from the Brenham School Board. 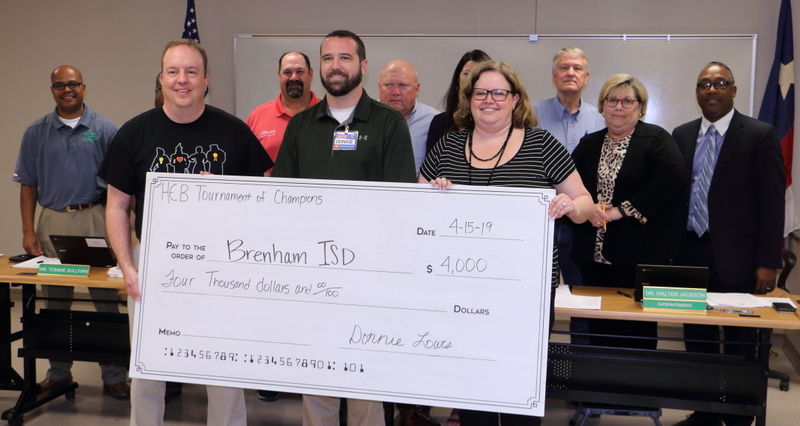 The board also accepted a $4000 grant from the HEB Tournament of Champions program. A portion of the grant will be utilized at the Alton Elementary School library. The board also accepted an award from the Texas Alliance of Black School Educators for its presentation at their annual conference. Donnie Lowes (center) presents the school district with a $4000 grant from HEB. Board President Natalie Lange accepts the award from the Texas Alliance of Black School Educators. After an executive session, the board voted to suspend, without pay, the probationary contract of an employee at Brenham Junior High School effective April 16. They also approved the termination of a probationary contract at the end of the school year. In addition, the board approved the renewal recommendation for administrator contracts for the 2019-2020 school year. Written by: Mark Whitehead on April 15, 2019.on April 16, 2019.